In various optical devices, such as telescopes, light with a specific wavelength needs to be suppressed. Other wavelengths, however, must be able to pass unhindered through a lens or reflect from a mirror. To realise this, such devices often have an antireflection coating (ARC). ARCs consist of one or more layers. If the layers are made from materials that can absorb a lot of light then the ARCs can be extremely thin. The thickness of the ARC can even be many times smaller than the wavelength of the light it is suppressing. Researchers from this Industrial Partnership Programme have developed an ARC that suppresses ultraviolet light (100-400 nanometres), but which is so thin that it can allow extreme ultraviolet light (13 nanometres) to pass through unhindered. They made the ARC for mirrors that are used in extreme ultraviolet lithography, an advanced optical process that images small structures on light-sensitive material. These structures are the building blocks of the complex integrated circuits from which modern computer chips are made. The refractive index in the UV region is strongly dependent on the materials used and the specific environment of the atoms in these materials (such as structure, density and molecular composition). Furthermore, the characteristics are critically dependent on how the various materials in the ARC are mixed. Consequently the development of an ARC for the UV region was no simple task. The researchers numerically determined which layer thicknesses and optical constants were optimal. Using this information they managed to produce an ARC from silicon, carbon and nitrogen. It is important that the reflection of extreme ultraviolet light is largely maintained. 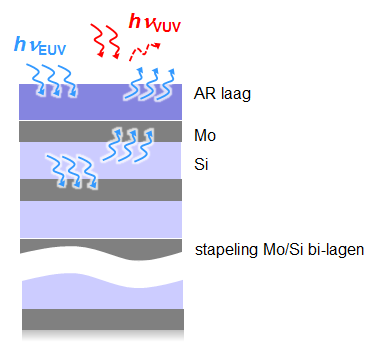 That was achieved: lithography has therefore gained a new optical element. Multilayer mirror for extreme ultraviolet reflection with integrated ultraviolet-antireflection coating.